System at SANGKRIT.net is a globally distributed order of humankind, who proceed for an all-inclusive execution. Enhancing everybody’s independent initiatives, personal outlets of SANGKRIT.net are run everywhere by individuals, who understand the program, helping everyone buy internet infrastructure, online support and global exposure for upgrading humanity into internet age. It is the revolution going on with freedom loving humankind increasingly join the movement. They themselves clean up their places and cook all their meals. They code immediate future of humanity and blog its arrival. Without discriminating on any basis, all of them clean, cook, code and blog, upholding the freedom for humanity from reactionary apartheid of all sorts to become free men and free women so that they keep busy upgrading humanity into internet age. Upgrading humanity into internet age is the greatest ever job given to anyone and unlike wage slavery, Sangkrit gives that without taking away all your independence. Selling internet infrastructure, online support and global exposure, you work everywhere as personal outlets of SANGKRIT.net, by doing all your works and together with everyone like you form the whole of a self-leading movement. Mastering your domestic entrepreneurship, you do everything for your free family and children. Sangkrit gives you a global reputation. You are respected as ambassador of the globally distributed order of internet growth engine. You compete with the largest conglomerates as best in the world. Working like that your family becomes rich and you are respected. Your kids are homeschooled in a world-class way for inheriting your domestic entrepreneurship and Sangkrit continues changing the world. You were not here. You won’t be here. You are given only some time as your life to perform and go away. Without considering anyone as part of yourself, you should be living your consistency by doing all your works as none is part of yourself. Nothing else has ever been that emancipating to humankind. SANGKRIT.net has its own internet-growth-based economic program for humanity. Opening-up opportunities to every individual for free education and employment, its self-sustaining business cycle works worldwide. Sangkrit, the economic program starts by selling SANGKRIT.net’s worldwide exposure that is produced all the time upon world-wide-web. Since corporates and sovereigns have amassed the most of public money on planet Earth, so we do ask them to buy it every time for independently releasing a lot more individual initiatives of humanity as nothing else could ever prevent many more ‘Occupy!’ movements from taking place. That is why we specifically invite the corporates and sovereigns alike to buy the worldwide exposure at SANGKRIT.net because every time this voluntary measure independently increases the capacity of this world for hosting humanity a lot more peacefully. It is more important to take care of massively enhancing a lot more individual initiatives, at the expense of the public funds amassed by corporate and sovereign interests, to compete with monopolistic situations than to let the governments regulate economy here and there. Internet Growth Engine SANGKRIT.net invites consolidated advertising support for running its Universal Free Homeschool of Internet Age that facilitates fluid courses in live education to support each individual business while people across all time zones register or transfer their domain names with free software support accessing global markets; thus making the whole world a lot better each time the Internet is expanded by another domain as private property. Facilitating this much SANGKRIT.net has already become the most global Internet media on planet Earth so sponsoring this earns an overnight reputation worldwide. Now it is popular across all the countries alike. Thus globally sponsoring this is the best of possible position that money can buy on Internet. This provides greatest possible leverage upon the internet growth in addition as the most of money is duly invested in expanding the searchable knowledge index of humanity, dedicated to help everybody in bringing own enterprise online and all the value-addition returns to the sponsors’ ad displayed upon all devices worldwide. Thus we seek the corporate and sovereign support to keep the Universal Free Homeschool of Internet Age running incessantly as whosoever is not yet brought on Internet is to be brought here and whosoever has access to it is to be taught to accumulate virtual wealth by registering a domain so that the ownership of Internet is indeed distributed up to every individual across all the countries alike. Connectivity across humanity, in mobility with portability, is very fast changing whole world. It helps a lot to let the knowledge get globalized. Doing that the Universal Free Homeschool of internet age helps everybody create wealth in webspace. Buying the worldwide exposure from SANGKRIT.net for a few quarters actually supports to keep it running till then. Everybody enhances virtual wealth of humanity by registering a domain as private property upon Internet. This boosts a continuous growth that never ends. For the first time in human history sustaining freedom is built around domains running wonderful utilities in webspace that human-beings enjoy. This actually expands the internet by registering new domains with free software support for doing business worldwide and by publishing new posts to make the humankind of internet age prepared for it. Every time more brilliant teachers get payment. Every time they deliver more interestingly useful complete lessons. Education is made here fashionable for technology as business, where individual startups get admission and the result comes as networth. Domain is the newest kind of private property after stocks. Not even a single bit of webspace is ever free of domain registry system. Upon the world-wide-web every domain, that somehow attracts users, contributes something to the overall value of internet. Reciprocating this value-addition, internet promptly returns adequate advertising worth to that particular domain, which can easily be sold for a recurring revenue. Once you develop something interestingly useful upon your domain, users from worldwide find it within no time. Whenever users arrive, the domain accumulates worth of some sort. This enhances overall worth of internet. That returns advertising value to it in accordance with that. It is such a unique course, again and again repeated upon world-wide-web that the largest-ever continuous competition is configured for staying interestingly useful. Enhancing the user experience has become the whole thing since whatever is not interesting or useful is easily ignored also. Likewise when anything does a lot better than others it starts monopolizing its sector within no time. Thus even start-ups compete with monopolies here. The largest-ever marketplace of internet simply works like that. We invite peoples of all countries to bring their business online at SANGKRIT.net. 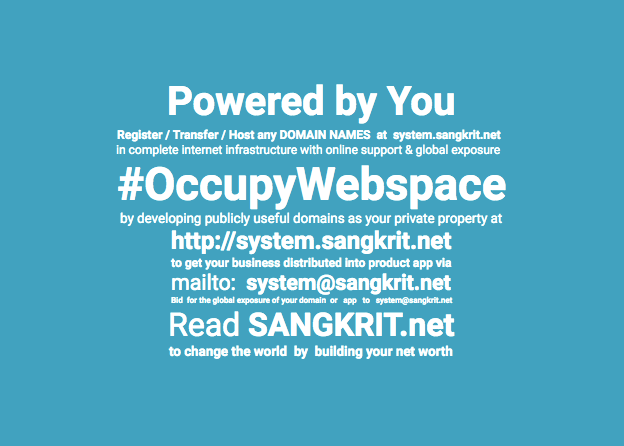 Online REGISTER or TRANSFER your DOMAIN at http://system.sangkrit.net for doing business worldwide. Domainers from elsewhere also can shift their web-presence to System.SANGKRIT.net as migration is made easy. What makes here your experience unique is that you get free software support for life so that nobody works for your domestic entrepreneurship except the free software that consistently evolves investing many light-years long seamless cerebral strength of humanity. You may even reasonably hire a free software programmer from worldwide for not more than hours enough to build your business online. Anyone may own an all-inclusive fully serviced website, on the domain of choice with dashboard access and round-the-clock free software support, delivering solutions weekly at US$ 50 a quarter or daily at US$ 500 a quarter or hourly at US$ 5000 a quarter, starting within 24 hours of payment via PayPal to system@sangkrit.net. Use it for your free press or business. System at SANGKRIT.net is distributing free domains with WordPress hosting upon android handheld devices so that independent programmers from across all the countries can develop those private properties worldwide for bitcoins. Moreover you may also create your private wealth in webspace by registering or transferring a domain at System.SANGKRIT.net as it is like a four wheels’ drive of domain, WordPress, android and bitcoin for creating wealth in faster lane as Internet Growth Engine. You may simply download android application from Google play to start with it. Thus every independent human-being individually owns his or her independent value-addition so that its quantum mechanics makes this globally distributed order gigantically superior to all possible patronage networks of old world and Internet grows only in private ownership of each individual while human-kind truly become collaborators in this collaborative measure of internet growth story. SANGKRIT.net is adamant upon involving everybody into this. This is fast leaving other entities far behind. With its globally distributed order as internet growth engine, it is reinventing business, technology and media of Internet Age. We invite successful domainers to get globally glorious. Once your domain is financially successful, you should contact system@sangkrit.net with your price-a-week offer to buy the footer credit-line of worldwide exposure yourself by sponsoring the Universal Free Homeschool of Internet Age, which facilitates fluid courses in live education to support each individual business while people across all time zones register or transfer their domains accessing global markets with free software support; making the whole world a lot better each time the Internet is expanded by another domain as private property. Again the most of value-addition, it simply brings back to the sponsors, because the searchable knowledge index of humanity is incessantly getting increased upon world-wide-web, with every step of this self-sustainable business cycle of Sangkrit. Growing very much similar to the pattern of overall Internet growth, SANGKRIT.net has made Internet marketing so simple that anything that is not averse to global regime of internet protocol will at once reach across all countries. Thus you most easily subscribe the global growth story of Internet. SANGKRIT.net is expanding the Internet as industry of technology, taking over as upcoming fashion, making modern people befitting for the internet age, with ‘See you online!’ as its tagline of globalization. Sangkrit insists that only permissible way to get taxed must come through a free fiscal policy worldwide that automatically taxes the users of its currency under an inflation mode on the basis of total transaction volume. The transaction tax under such an inflation mode upon the usage of a particular currency shall put a full stop on unethically compelling the internet industry for bureaucratic submissions so no non-productive legal designs could ever deviate entrepreneurs’ attention from actual business. Sangkrit, as a neutral webspace, allows all the entities to participate through this program and the System at SANGKRIT.net globally responds if anytime anywhere anyone needs help. This has become an ongoing public rally upon world-wide-web across all time zones with continuously increasing global participation so endorsing anything appropriate to its ecosystem is possible for a price to meet out its ever-growing cost of growth. Any entity on planet earth can request, by submitting its purpose to system@sangkrit.net, for price along with an internet advisory in this regard.